For Dummies books are famous for presenting different topics in a easier fashion. Whether that means directions on how to hook up a home network, carve a turkey, knit your first scarf, or load your new iPod, you can trust Dummies.com to tell it like it is, without all the technical jargon. Enterprise suffers from new risks everyday from its applications. Hacker attempt is the main source of nightmare all the time. Traditional firewalls serves as a boundary between the Internet and an organization’s private network and protects based on controlling specific protocols and ports, and restricting traffic to and from specific IP addresses. These firewalls ignores ports 80 & 443 which are used for http and https respectively. Hence, modern day attacks are mostly web based and targets those ports. Next-Gen Firewalls (NGFW for short) go beyond the conventional firewall functions by adding security capabilities such as intrusion prevention. The concept of NGFW was brought about by Palo Alto Networks who introduced the first of these type of devices. 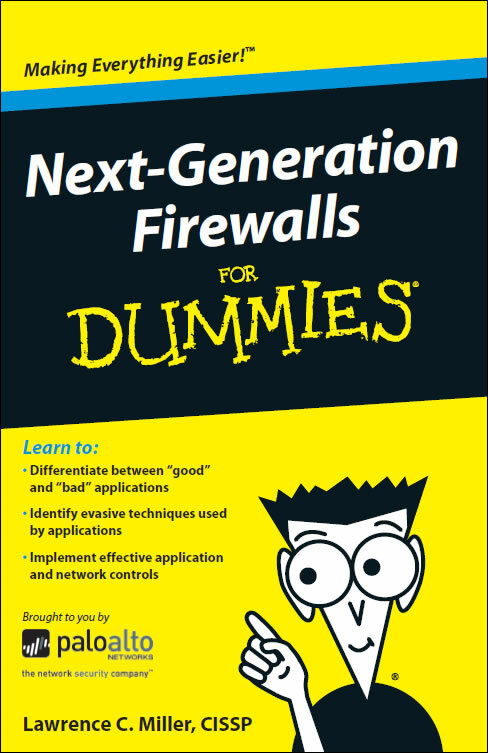 Palo Alto Networks recently have taken an initiative to literate common peoples and enterprise personnel with the new type of web based threats and the indispensability of the NGFW and are distributing a free eBook Next-Gen Firewalls for Dummies. written by Lawrence. C. Miller. This book provides an in-depth overview of next-generation firewalls. It examines the evolution of network security, the rise of Enterprise 2.0 applications and their associated threats, the shortcomings of traditional firewalls, and the advanced capabilities found in next-generation firewalls. and follow the instructions and you will be finally prompted to download or open the PDF eBook of Next-Gen Firewalls for Dummies. This entry was posted in eBook, Free Offers, Security Related, Tips.